So, now that I have a dresser to stow my clothes, I get to actually fill it with my things! But what about ontop? For things like jewelry and accessories? Previously, I used command hooks straight on my mirror. Which looked like crap. Then I found a pair of tea cup hooks. They’re great! Shiny and hook-like for hanging necklaces and such. But we only had two. Now, I could go out and buy more. But that would be too easy. Instead, I found a tree branch. I found one that had a good squiggle to it. The trouble with the squiggle is it makes it hard to actually hang things on it. Instead things slide down. But there’s a simple fix for that! 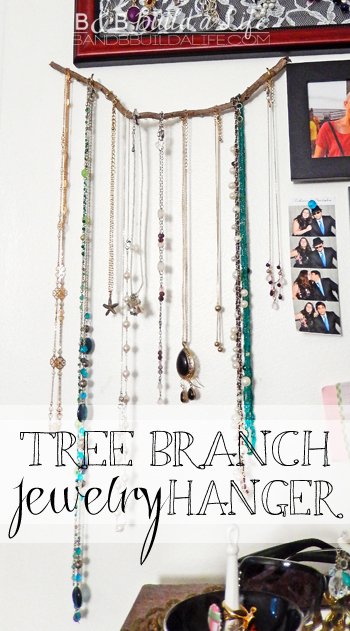 You’ll need the branch and a hot glue gun. The inspiration behind this was the grippy rubber edges you’ll find on Target hangers. Same concept but here the beads create ridges that necklaces can grip on instead of sliding past. Once I finished with the glue, I slipped the branch back into the hooks and loaded it up! The glue beads worked perfectly! And now I have a funky (hipster-y?) place to keep my necklaces. I think it worked out pretty good!